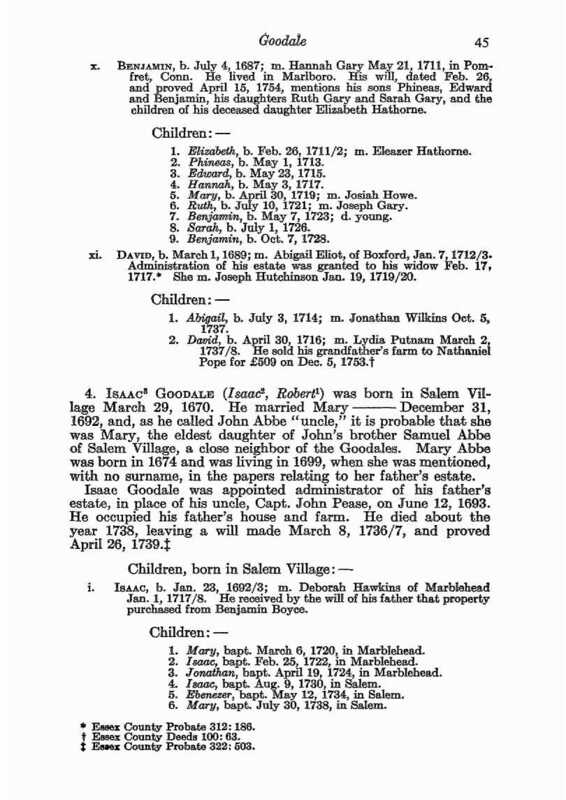 Robert GOODALE (1601 – 1683 ) was Alex’s 12th Great Grandfather; one of 8,192 in this generation of the Miner line. 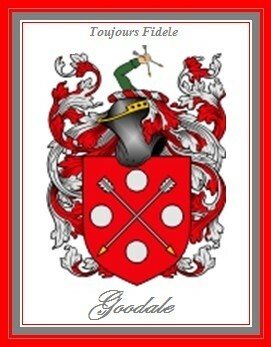 Robert Goodale (Goodell) was born in Aug 1601 in of Ipswich, Suffolk, England. He was christened on 16 Aug 1601 in Dennington, Suffolk, England. His parents were Robert GOODELL and Joan ARTYS. He married Catherine [KILHAM?] about 1629 at Easterham Suffolk England. They immigrated in April 1634 sailing on the “Elizabeth” from Ipswich. 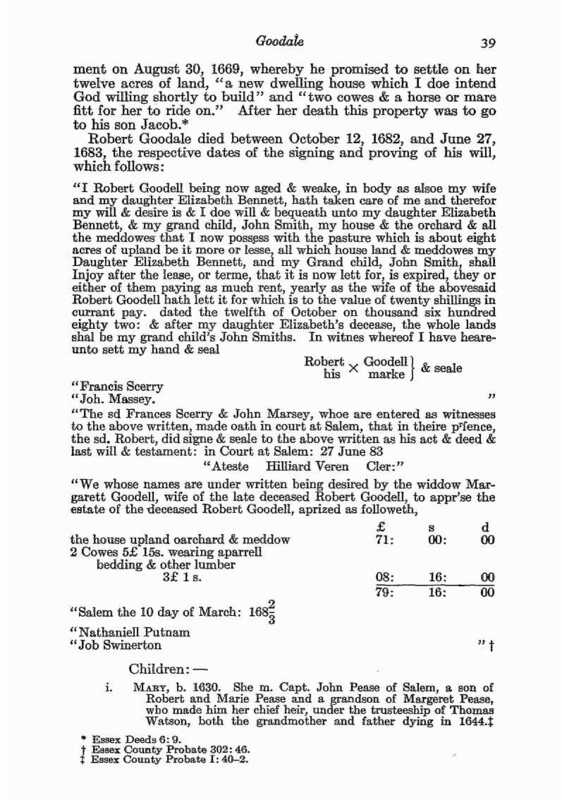 “Robert Goodall”, aged 30, and “Kathern, his wife,” aged 28, were enrolled at for passage to New England on the Elizabeth[Hotten 280];on 30 April 1634, “Mary Goodale”, aged 4, “Abraham Goodale”, aged 2, and “Isaacke Goodale”, aged “half a year,” children of “Rob[er]t Goodale”, were enrolled at as passengers for New England on the Elizabeth[Hotten 282]. After Catherine died, he married Margaret Lazenby on 30 Aug 1669. Robert died 4 Apr 1683 at Salem or Danvers Mass. 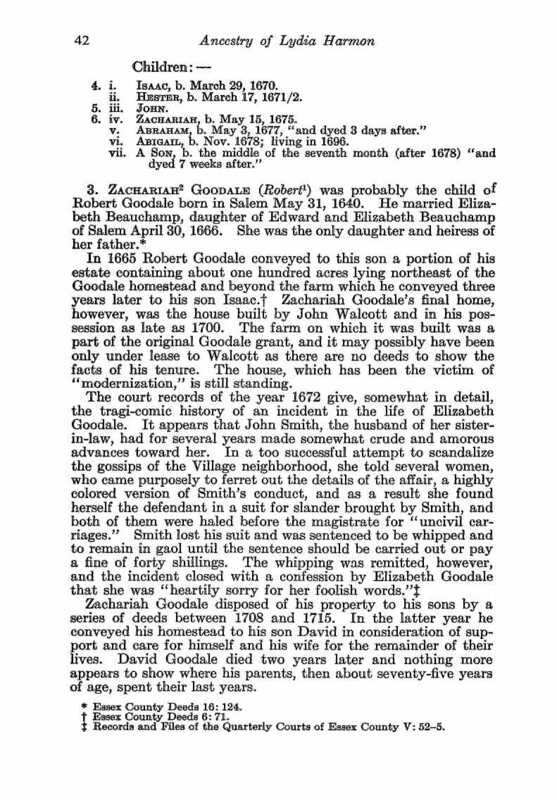 In her will of 1 March 1601/02, “Elizabeth Goodale” of , mentioned three sons, including Robert, and “Henry Kilham and Alice his wife, my daughter”[Waters 2:1403, citing Archdeaconry of Suffolk 38:478]. This latter couple were the parents of Austin KILHAM and this may be what led George E. Williams to claim that the first wife of Robert Goodale was “Catherine Kilham”. While there is little evidence for this identification, the fact that one of the daughters of Robert Goodale married a son of Austin Killam suggests that there may be some relationship. Catherine died 10 Sep 1666 in Salem, Essex, Mass. 30 August 1669 – “Robert Goodell have made choice of & by God’s permission do fully intend to take to my wife Margaret Lazenby, late of Exeter in New England (& the which being done), I the said Robert do hereby covenant & promise to & with the said Margaret, that in case she outlives me, to give & bequeath unto her for her comfortable maintenance … a new dwelling house which I do intend God willing shortly to build, with what household stuff therein God shall please to continue unto me until my death; item: two cows & a horse or mare fit for her to ride on, also my whole orchard upon my farm near my dwelling house at Bald Hill, with six acres of the planting ground upon which the said orchard stands, the best of the said ground & four acres of meadow ground near to my said orchard with a pasture plot of about two acres fenced in near to my said house & orchard & also that she shall have a competency of fire wood & timber for her use … & after her decease … shall fall to my son Jacob Goodell … [and] in case she outlive my said son Jacob that then she shall have & enjoy for her use & benefit that part of my estate which I shall & do intend to leave unto my said son Jacob, during her life”. Robert seems to have devoted his life to the development of his large grant for the benefit of his sons and daughters to whom, as they married, he gave generous acreages as wedding gifts, thus creating a family settlement about his own homestead. His firm, clear handwriting would indicate a good education, but he took no part in governmental affairs and his name seldom appears in the records in any capacity except as plaintiff or defendant in suits based on the ownership of his land and stock. On August 30, 1669, he made a settlement on his second wife, Margaret: “12 acres of land, a new dwelling house, two cowes and a horse or mare fitt for her to ride on.” He died and his will was proved June 27, 1683—he left his estate to his daughter Elizabeth and his grandson, John Smith. Wife Margaret was mentioned as having already been provided for, as were his other children. Robert was recorded as age 30 by the Customs House when he came to this country in 1634 which would make his birth 1604 instead of 1601. There has been much speculation as to who Robert’s parents were, but their identity has not been proven. One current theory, as suggested by George E. Williams in his book, A Genealogy of the Descendants of Robert Goodale/ Goodell of Salem, Massachusetts, states that Robert Goodell was the son of Robert Goodell and Joan Artys, who was born in 1601 and was baptized 16 Aug 1601 in Dennyngton, Suffolk Co., England. There are other families with sons named Robert of his generation, but in no case do the few known facts go together correctly. Robert, his wife Katherine and three children, sailed from the port of Ipswich, Suffolk Co., England on 30 Apr 1634 on the ship “Elizabeth” in charge of Captain, Mr. Andrews. They took the oath of allegiance and supremacy at his Majesties Customs House on 12 Nov 1634 at Ipswich MA. Sailing on the same ship was Margerie Washburn, the wife of John Washburn and their two sons, John and Philip. They were the ancestors of the Putney, Vermont Washburns who married into the Goodell family in the 9th generation. Also, on board were John and Anne Crosse, who were probably the ancestors of Hannah Cross, who married John Munroe. John Munroe was the great grandfather of Minnie Jane (Monroe) Scott, and three of her children married into the Goodell family. According to Bowen’s account and the History of Salem, they made their home at Salem,”in the field northeasterly of Cold Spring in North Salem,” where he was granted a house lot and an acre of land in 1636. He obtained another 20 acres in 1639 and 1652. By 1651, he had 480 acres of land in Salem. 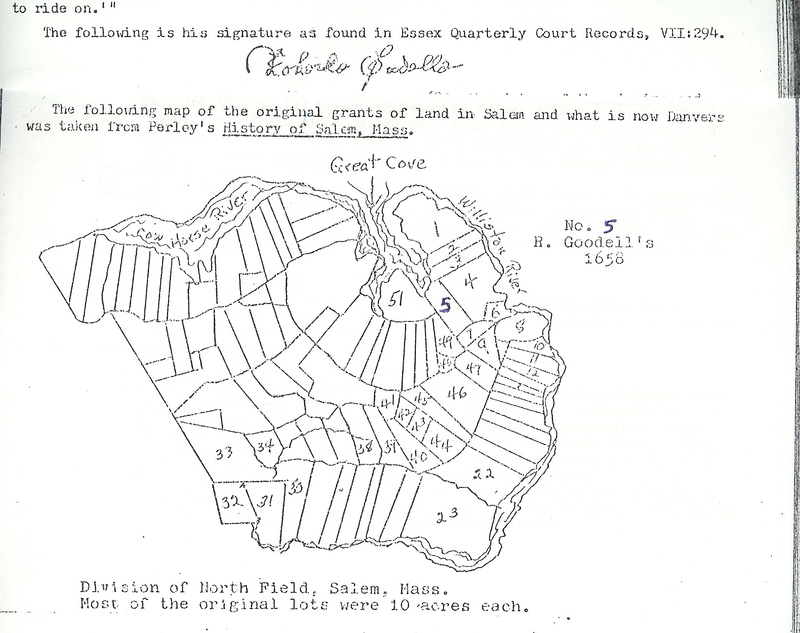 1658 Lot #5, 1663, Lot #55 -The Division of the North Fields was laid out before the Salem town records were begun. Most of the original lots consisted of ten acres each. See the above link for the location of Robert’s land and his many real estate transactions. Throughout his half century of residence in Salem, Robert pursued a single goal with great determination. So far as we can tell he was never a church member, never a freeman and never an officeholder. The vast majority of the records in which he appears, even his few minor criminal transgressions, involve his dealing with land. He devoted much effort to the amassing of land, and the provision of estates for his children. …the first record of the Goodells in America [at Salem], indicated that they settled at Great Cove in the North Fields. This Spring, so often mentioned in the early records in what was later called Liberty Hill Park [Liberty Hill Avenue Google Maps], was on Robert Goodell’s farm and was known for the first half century of Salem’s history as Goodell’s Spring. It is not recorded how he acquired this first farm. However, in 1636 and in 1638 he received grants of twenty acres each in that portion of the town which became known as Salem Village, and he gradually acquired by purchase similar grants made to other early settlers, until by 1651, he was the owner of a tract of land at Bald Hill comprising four hundred and eighty acres, which was confirmed to him by a town grant on November 7, 1651. He probably moved to this new property at about that time, and, as opportunity offered, disposed of his Great Cove farm, deeding the house and a portion of the land to his son-in-law, John Smith in 1658. Another lot was conveyed to Nicholas Manning in 1667, and a third conveyance was probably made to John Orne, who owned a part of the property, hitherto unconveyed in 1684. Robert was a farmer. “He was a man of piety, of education, of considerable wealth, of great strength of character, a helper in all important matters — such was our ancestor, Robert Goodell” (Versailles). In 1670, the people of Salem petitioned for a church of their own and Robert Goodell’s signature is on that document. Robert does not appear to have taken part in govenment affairs. 27 Dec 1642 – “Robert Goodell” was one of twelve men “presented for breach of order of court, keeping their cattle in the common corn fields” and fined for this infraction[EQC 1:49]. 26 Dec 1643 – “Robert Goodell” was one of eleven men “fined for putting their cattle into the north corn fields”[EQC 1:56]. 27 Aug 1644 – “Robert Goodell [was] fined for suffering his goat to go in his neighbor’s cornfield”[EQC 1:69]. 18 Feb1645/46 – “Robert Goodell was accused by Myghel Sollis (also Sallow) of stealing four goats. Sollis had lost one old and three young goats and finding such, with his mark on them, in custody of Goodall, the latter promised to return them. When Sollis went for them, Goodall said that he had killed one and the rest were lost. Quit for lack of testimony”[EQC 1:91]. 11 July 1644 – “Robert Goodell complained of Ruben Guppy for rent and burning fence”[EQC 1:68]. 27 June 1671 – “Rob[er]t Goodell” sued “Gartrid Pope for withholding or molesting, mowing and carrying away the hay on a parcel of meadow. Withdrawn”[EQC 4:384]. In 1668, Robert built a house for his son Isaac. Save for a decade or so in the early 1900s, the Goodale family has lived in this house since it was built. 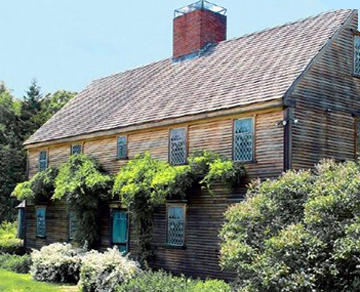 The timber frame saltbox is one of the best preserved examples of a first-period house in New England, and is listed on the National Register of Historic Places. But after nearly 340 years of ownership, the Goodale family put the place on the market in 2009 for $1.39 million, hoping to attract a buyer who will respect the storied structure’s origins. In 2010 it was still on the market. Equally exquisite is the 41-acre property near Ipswich the house sits on, with rolling meadows bordered by woods that sweep down to Great Marsh – the largest salt marsh in New England – with a view of Hog or Choate Island beyond. This is not the home’s original location. It was built in Salem, by Robert Goodale for his son Isaac. The Goodales had sailed from England to Salem in 1634, just 14 years after the Pilgrims dropped anchor in Plymouth Harbor. Robert purchased more than 500 acres in Salem and gave land to his children upon their marriages. Sometimes, he built houses for them, as he did for Isaac, a farmer who lived in the house for just over a decade before he died in 1679. Isaac’s descendants remained in the house until 1915, when it was sold, for reasons unknown. Three different owners occupied the house over the next several years, and it was put up for sale again in 1928. Dr. Robert Goodale, a Boston physician and a direct descendent of Isaac’s brother Zachariah, learned from a newspaper article that the house was for sale. “He went right out to look at the house, bringing a building inspector with him,” said Maisie Crowther, 72, the youngest child of Robert Goodale, who now lives in Brattleboro, Vt. “He and my mother decided to buy it then and there. They wanted to bring it back into the family. They wanted to preserve it. The sale price was $5,000, a hefty sum for the era. Goodale’s plan was to have the house moved from Salem to Ipswich where it would be a summer haven for the couple and their four children. 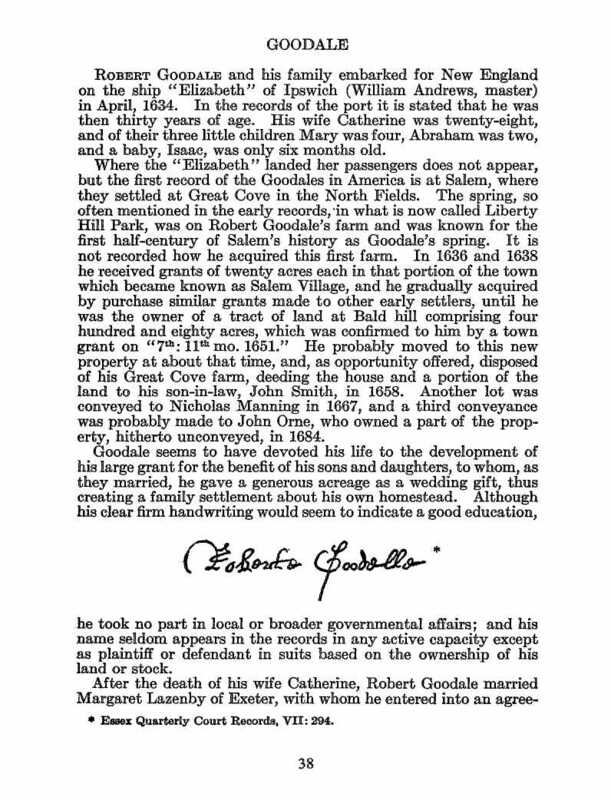 Robert Goodale’s father, Joseph, owned a commercial orchard on Argilla Road and gave him 41 acres at the end the narrow dirt lane. Before the house was transported, the Goodales discovered a few of the home’s original 17th-century narrow casement windows with diamond-shaped leaded panes in the basement. They restored the windows and had replicas commissioned for the rest of the house. During reassembly, they also exposed the original raised paneling and returned the openings of the home’s four massive fireplaces to their original size – nearly 6-feet long and 4-feet high. 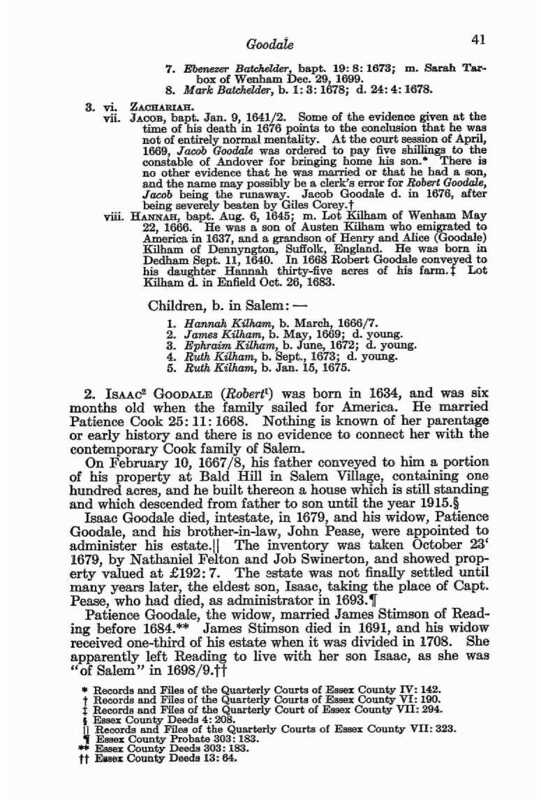 Isaac’s wife Patience Cook was born in 1635. Her parents were John Cook and Mary Roote. 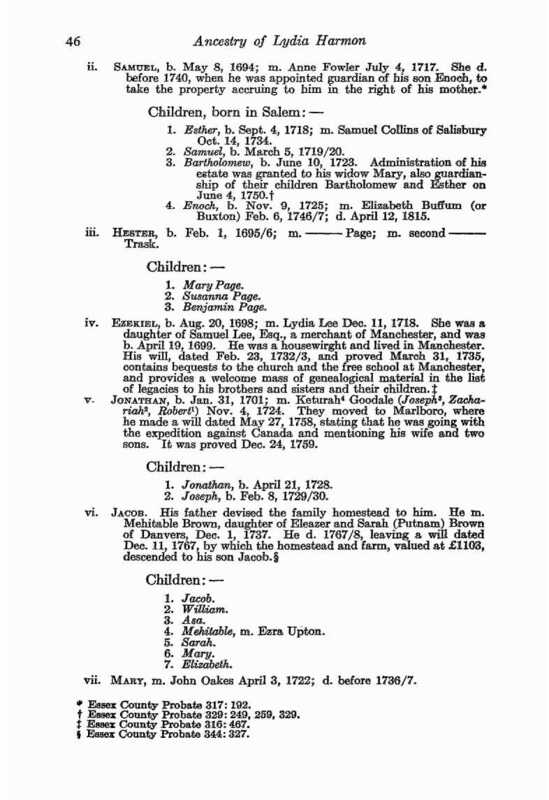 After Isaac died, she married 1683 – Reading, Middlesex, Mass. to James StimsonPatience died in 1699 in Salem, Mass. Nehemiah’s wife Hannah Haven was born 22 Feb 1646 – Lynn, Essex, Mass. Her parents were Richard Haven and Susanna Newhall. 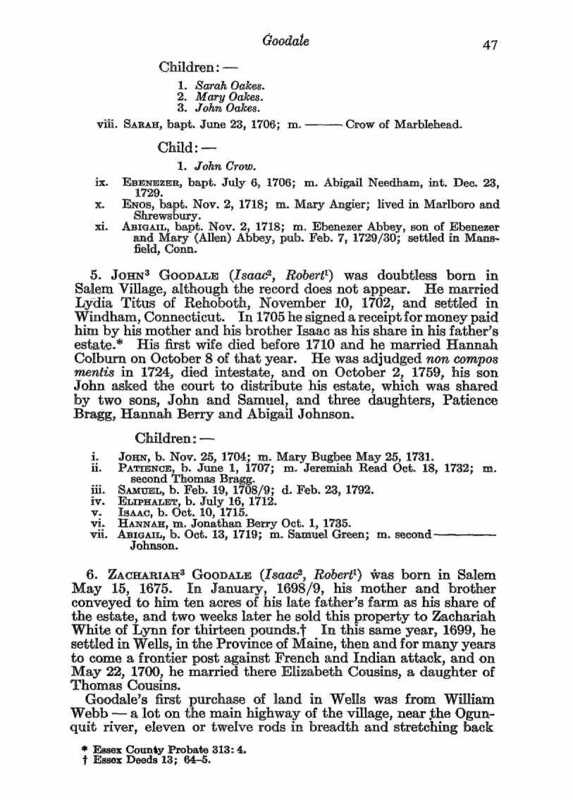 Hannah died 01 Jan 1727 in Framingham, Mass. Elizabeth’s first husband John Smith was born about 1645 – Edgartown, Dukes, Mass. His parents were Richard Smith and Mary Weed. John died 6 May 1672 – Salem, Essex, Mass. John Smith was involved in a scandal with his sister-in-law. See Zachariah Goodale’s section for details. Elizabeth’s second husband William Bennett was born about 1635. His parents were Peter Bennett and Elizabeth Fielder. William died in 1692 in Salem, Mass. 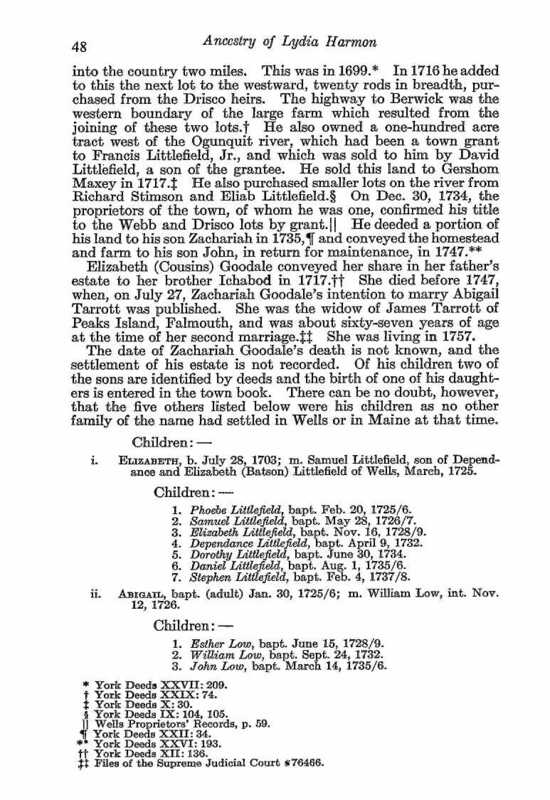 Zachariah’s wife Elizabeth Beauchamp was born 23 Jul 1646 – Salem, Essex, Mass. Her parents were Edward Beauchamp and Mary Metcalf. Elizabeth died 1682 – Salem, Essex, Mass. 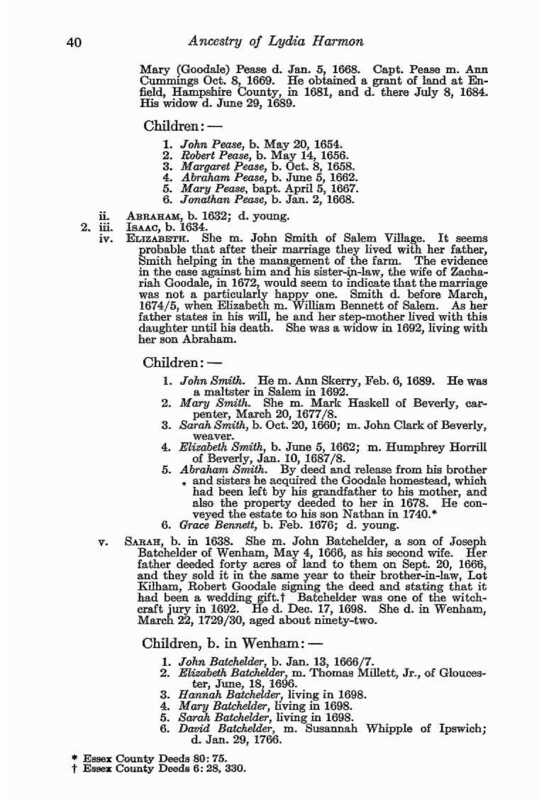 June: John Smith v. Zachariah Goodell and Elizabeth, his wife. Slander. The defendant allowed costs. Writ, dated June 10, 1672, signed by Hilliard Veren, for the court, and no return made. Bond of Zachariah (his mark) Goodell and Elzabeth (her mark) Goodel. Bill of cost, 7s, 6d. Plaintiff’s plea: that he objects to defendant saying that she kept the abuses, which he was alleged to have committed, private for years and would never have revealed them but to save herself from damage against her in court. Defendant’s plea: the court was asked to judge of the legality of the attachment, for the law provides six days for the defendant to prepare his answer and testimony; the attachment was for slander but mentions no time nor place nor word of slander; defendant had said many things concerning plaintiff for many years upon many occasions and if common fame my be credited “it is not a very easy matter to slander the plaintiff.” Summons appearing not to be legal, defendant requested a nonsuit. John Smith and Elizabeth, wife of Zachariah Goodell, being bound over to this court to answer to several abusive and uncivil carriages between them, with which said Elizabeth charged said Smith, the latter desired to be tried by a jury, who found him guilty. Court ordered him to be whipped on the next lecture day in Salem and to remain in prison until the sentence be executed unless he pay 40s. Upon supplication of Anthony Needham and Giles Coree, who engaged to pay the fine and gaol charges within two months, his sentence of being whipped was remitted. Summons to constable, John Suthwick of Salem, for the apprehension of John Smith, and Elizabeth, wife of Zachery Goodell, and to bring them to Mr. John Gardner’s, dated 11: 4: 1672 (4 Jun 1672). Summons also for witness, Gould and his wife, Tho. Flynt’s wife, Coree’s wife, Carrill’s wife, Anne Needham and Kelam’s wife, dated 15:4:1672 (15 Jun 1672), and signed by Wm. Hathorne, assistant. Lot Killum and Zacheriah Goodell deposed that John Smith, being at said Goodell’s house, the latter’s wife being present, said that he was sorry for what he had done to Goodell’s wife and prayed God to give him repentance, hoping he should do so no more. Zacheriah replied that he wished God would give him repentance. Edward Beachum and Zachariah Goodell were bound for the latter’s wife Elizabeth’s appearance. Thomas Flint, Giles Coree, John Rubton and John Smith were bound for Smith’s appearance. Mary Corey, aged about forty-three years, and Mary Carrill, aged about thirty-five years, testified that Elizabeth Goodell told them that one time as John Smith, her brother-in-law, was working in a swamp near her house, he called to her for fire, so she carried it to him and laid it on the side of the brook, he being on the other side. He asked her to tarry and smoke, and she told him she had already smoked, so she ran away up the hill and he ran after her, etc. Also at another time he assaulted her when he fetched her from her house to help his wife when she lay in, so that she jumped from the horse on which they rode. Also when he was at Lott Keellam’s digging a well, and once on a Lord’s day while her husband was at meeting, etc. She said he was an ugly rogue and threatened to tell her husband, and that he had been uncivil to her ever since her son Zachery was a little boy, but she feared that if she told her husband, said Smith would kill her or her children or hurt her creatures. She told deponents that these things were true and that she would swear to them before the best magistrate in New England. Hannah Flint, aged about twenty-two years, deposed that she was at John Smith’s house at the time of his wife’s lying in, and Elizabeth, wife of Zachary Goodell was there also, etc. Deponent heard said Elizabeth tell of lascivious language used by both herself and Smith, and also heard Patience, wife of Isacke Goodell, affirm to her sister’s face, etc. Patience Goodell and Hanah Kellum testified that the foolish words that their sister Elizabeth Goodell spoke to them about Smith were said in a jesting way. Geyles Corey, aged about fifty-five years, deposed that Elizabeth, wife of Zackary Goodell, related to him that on a morning after she and his wife had been at the house of Nathaniel Carrell, coming into deponent’s house, John Smith being there, said Elizabeth had been affronted by said Smith. Deponent asked her where he and his wife and daughters were. Her answer was that she was in the house and went up the ladder into the chamber and that his wife was near some bushes at the door taking in linen. He said if there had been anything amiss, she should have told him then, but when he came down he saw nothing but laughing and smoking. Elizabeth said that she was like to have broken her brother Smith’s head with the ladle and his wife said if she had, there would have been but six pence or a groat to pay. Later Elizabeth told deponent that she knew he was in the house, etc. Lott Killum deposed that his wife being lame from a fall that she received upon a rock, John Smith offered her abuse, and she told him of it at night. Whereupon deponent dealt with said Smith privately about it. An Needham deposed that she and her husband were in Elizabeth Goodell’s house, with the wife of Thomas Flint, when deponent’s husband told said Elizabeth that she was foolish to have reported such stories, and she said that they would not have gotten out if she could have helped it. Also that deponent heard Nethanel Carall say that Elizabeth had said several times in his house this winter that she wished that the old folks were gone, etc. Also that the wife of Robbert Goodell told Hanna Flinte that in the winter time she told her old man that Smith and Betty were together very much. John Harrod and his wife testified to the same. 20 Jan 1638. His parents were Joseph BATCHELLER and Elizabeth DICKENSON. He first married Mary Dennis 12 Jul 1661. John died 17 Nov 1698. Jacob was killed at age 34 by Giles Cory, for whom he worked. He was beaten and died soon afterwards. The coroner’s jury said “The man was bruised to death, having clusters of blood about the heart.” Giles Cory was fined for the offense. Some of the evidence given at the time his death points to the conclusion that he was not entirely of normal mentality. At the Court session of April 1669, Robert Goodale was ordered to pay five shillings to the constable for bringing home his son. Longfellow wrote a poem about the death and trail but used the name “Robert” instead of “Jacob” the son. Giles Cory was pressed to death at age 80 in Salem Mass., a victim of the witchcraft trails of 1692. When Corey was accused of witchcraft with five other men years later, the murder of Jacob came back to haunt him during his trial. Refusing to plead, Corey was crushed to death when the tribunal ordered heavy stones be laid on his body. That is enough; we need not question further. What answer do you make to this, Giles Corey ? See there ! See there ! What is it ? I see nothing. He comes here to bear witness to the crime ! The crowd shrinks back from Corey in horror. Bear witness to your guilt, and you must die ! Will be on your own head, and not on ours. Twice more have room to plead or to confess. Pressed by great weights until you shall be dead ! And may the Lord have mercy on your soul! 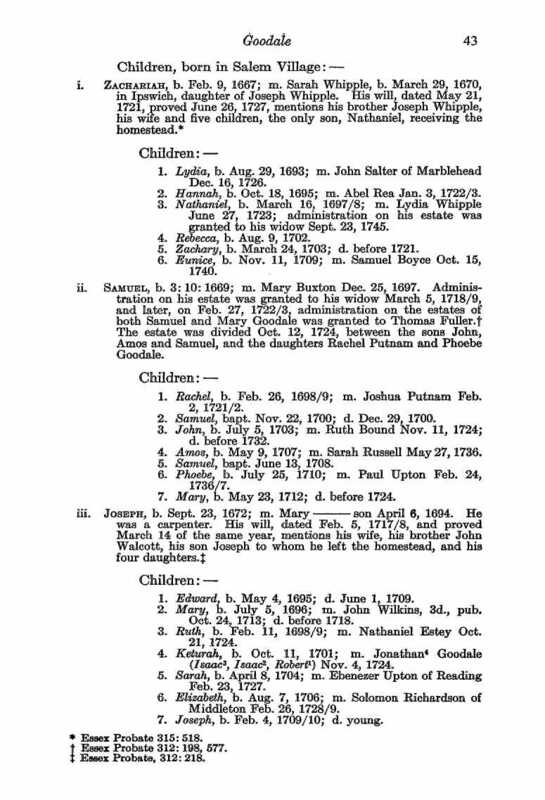 Hannah’s husband Lot Kilham was born 11 July 1641 Salem, Essex, Mass. His parents were Austin KILHAM and Alice GORBALL. 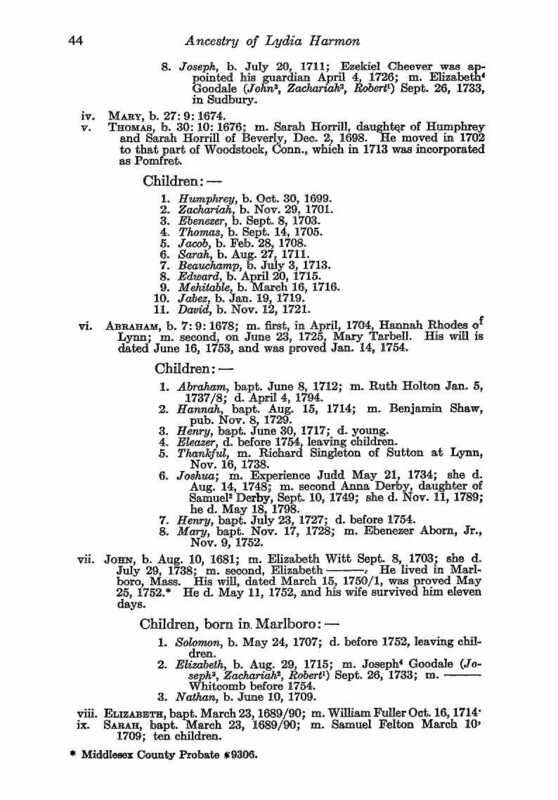 Lot died 26 October 1683 in Enfield, Hartford, MA . This entry was posted in 14th Generation, Artistic Representation, Immigrant - England, Place Names, Storied, Twins, Violent Death and tagged Dad of Longfellow's Ghost, His house in his family for 340 years, Salem, The Elizabeth 1637, The New England Tragedies. Bookmark the permalink.